This handsome stud is Jake. 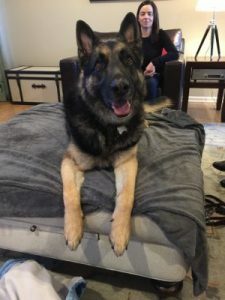 Jake is a rescued German Shepherd that was found wandering the streets until he was brought to his forever home. He is a young bloke that found himself really struggling with some pain and discomfort, accompanied by a fairly consistent limp in his front leg. After a full work-up, Jake’s x-rays showed he had some significant arthritis in his elbows, one side worse than the other. After giving Jake pain medication for a significant amount of time, his fur parents decided to give chiropractic a try because Jake’s cousins had both been doing so well under care. Within two adjustments Jake’s limping had decreased significantly, pain medication wasn’t necessary, and his movement and energy was up. Jake was doing fantastic and he hardly even showed the slightest bit of discomfort. When it comes to arthritis, what already exists cannot be erased, and that is imperative to understand. Arthritis is something that should be prevented as long as possible, when at all possible. Keeping joint motion within normal is one of the best ways to protect against arthritis formation. Chiropractic is one of the many ways to make sure structure is sound and joint motion is at an optimum. Jake may not be able to diminish what he currently has, but we can certainly help prevent more from forming!